Processing is possible for such small quantity as 6ml. 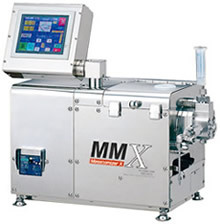 Only 6ml of material can be processed thanks to the short processing route. Less material contact parts reduce material cost, as well as shorten time for disassembling and cleaning. LCD ( touch panel ) enables stress-free operation. The LCD can be so tilted that you may operate easily, and see clearly. In addition, an extremely small amount of sampling is possible thanks to the in-put/ out-put quantity adjustable device. 200Mpa processing by electromotive operation. Maximum processing pressure 200Mpa is supplied by the electromotive method. Models operated with AC 100V power supply are included in our product range. Moreover, you do not need to prepare extra electric power supply devices. 5L/min in the case of optional heat exchanger supplied.